It is something of a myth that using a good camera, like a Nikon D5100, or a Canon EOS 60D, will automatically give you the great shots you desire. It is, of course, totally untrue. It is entirely possible to take bad pictures with an SLR camera. In fact, some might argue that you have less of an excuse for taking poor pictures when you’ve spent upwards of $600 on a camera, and that puts you more at risk of ridicule. Alright, let’s be honest, unless you’re being paid to take pictures for weddings, or fashion shoots, you’re unlikely to be ridiculed. But, for the most of us, hundreds and hundreds of dollars on a camera is too much for what we use it for. Most of us will, however, have a relatively decent point-and-shoot camera in our pocket already. That’s right, I’m talking about your phone. Rather than plumping down a small fortune for an SLR camera, and then spending valuable hours learning how to take a good picture with it, why not learn how to take good pictures with the camera you likely already own? Before we get into some tips for taking great pictures, I should probably clarify that you will not be able to take pictures as that look as good as professionally taken shots using expensive, professional equipment. But, that doesn’t mean you won’t be able to take great looking pictures that are good enough for any photo album. Understanding the basics of photography will always stand you in good stead when it comes to taking the perfect picture. Think about a professional photography studio; how much equipment do they have as well as their expensive cameras? Obviously, I don’t expect you to go out and buy a proper lighting kit and a softbox, but understanding how big a difference lighting can make to your shot will greatly improve the quality of your shots. Avoid harsh lighting and high contrast, but make sure there is enough light to allow your phone camera to distinguish between the focus of your shot and the background; phone cameras are notoriously bad in low-light conditions. Always avoid direct sunlight or any other bright source of light, as this will just result in glare and unwanted lens flare. While we’re on the subject of the basics, always make sure the background of your shot is not competing with the focus. You want the background to have a bit of life, but you don’t want it drawing the attention away from the focus of your shot. In short; don’t do it. Now, lets get into some of the advantages you have shooting with a phone over one of those expensive professional camera. Starting with apps. 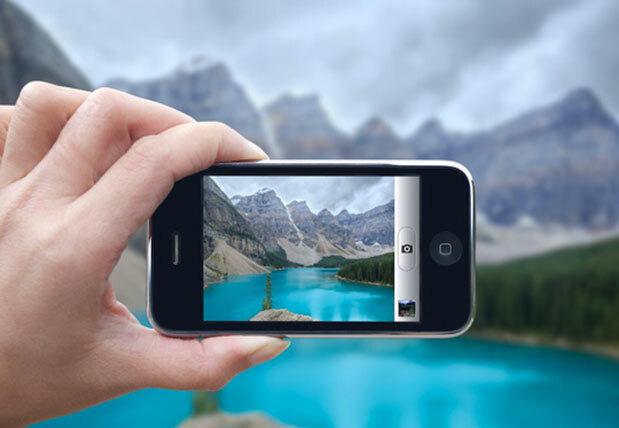 There are a number of apps out there for photography lovers. From the more gimmicky types that add a range of special effects and borders to your picture, to the more serious ones that try and emulate HDR (high dynamic range), or implement a host of other tricks to make your picture look that little bit more professional. Play around with the free versions, and if you find one that works for you, it might be worth handing over your hard earned cash. Try not to be sucked into the belief that filters make everything alright, though. The phenomenon that is Instagram has led a lot of people to believe that simply applying a retro filter to an image will make it good. This is not the case. There is a place for these kinds of images, and they are, ultimately, harmless fun. But don’t fall into the trap of thinking that a few good shots in Instagram makes you a professional photographer. My final creative tip is less advice for shooting with a mobile phone, and more advice for anyone taking pictures with any device, be it a super expensive SLR camera, or a disposable camera you picked up at the supermarket. Try different things. You never know what quirky little effect you’ll get from bending the rules. Perhaps a slither of sunlight framing the face of your focus will add a bit of impact to your shot, or that smudge I told you to clean might somehow create a bit of well-placed diffusion. When it comes to anything creative, there is always room for the weird and wonderful. There’s always room to break the rules. Try things, just don’t be too precious about your pictures if they turn out rubbish! And, ultimately, if you’re capturing a special moment, don’t worry about the quality of the picture if your attempts to make it perfect will result in you missing the moment. Not every picture needs to be perfect. Clean your lens. People who do own those expensive, high-end cameras, also have covers for the many and varied (and equally expensive) lenses that they own. This is because the slightest smudge, or spec of dust on the lens will ruin any shot. Your phone, in contrast, is often exposed to greasy fingers, the contents of pockets, and so on. It will get dirty, there’s nothing you can do about that, but you can make sure it is clean before you take a picture with it. So, there we have it. There’s no need for those of us who will only ever be hobbyist photographers to worry about getting the latest and greatest equipment with which to shoot our masterpieces. With a bit of thought, a little bit of skill, perhaps some luck, and a grasp of basic photography, we can shoot great pictures with the phone we already own! Author Bio: Marius Tanase – an internet enthusiast, who has been involved in web content and management for over 3 years. He currently is Editor of Wallpapersfame!